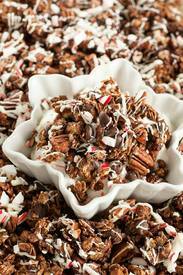 Triple chocolate peppermint bark granola! I’m faiiiiiirly certain you don’t need an ounce of convincing to make this granola. In fact, some of you have probably already dashed into your kitchens to see if you have all the ingredients on hand.